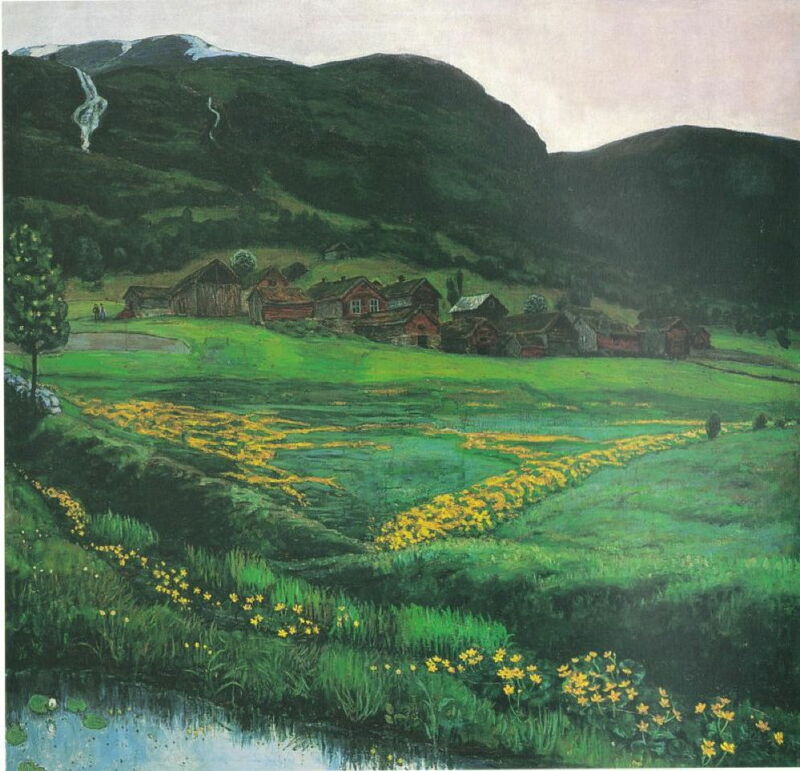 For the young Nikolai Astrup (1880–1928), 1905 had been a year to celebrate: he had his first one-man exhibition in Oslo, which sold many of his paintings, including one into the national collection, and Norway had gained its independence from Sweden. The following year, he was hailed as one of the most promising artists of a group exhibition of Norwegian art in Copenhagen. Nikolai Astrup (1880–1928), A Clear Night in June (1905-07), oil on canvas, 148 x 152 cm, Bergen Kunstmuseum, KODE, Bergen, Norway. Wikimedia Commons. 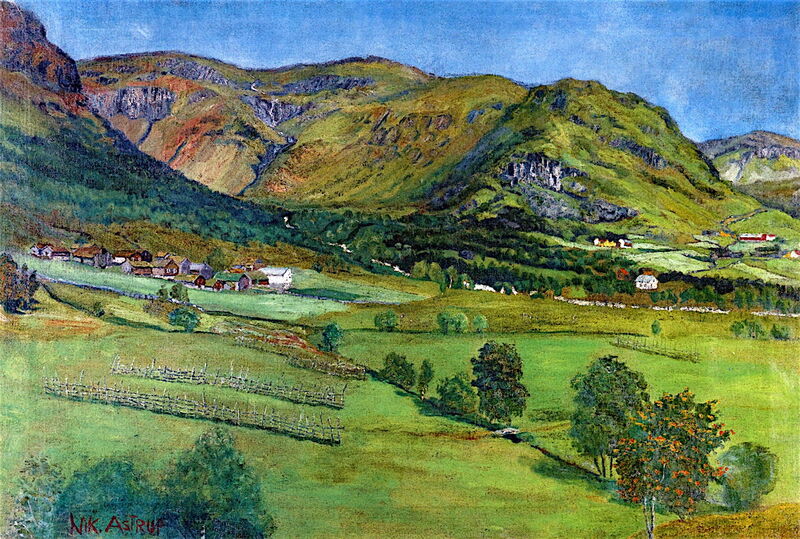 A Clear Night in June (1905-07), above, and A June Night and Old Jølster Farm (before 1911), below, are two of more than a dozen paintings which Astrup made of this farm after about 1902. These were painted early each summer, when in some years there were still the remains of the winter’s snow on the rugged hills behind. The waterfalls cascading down the scarps are still in spate from the melting snow. Astrup painted this view when the blossom was on the trees, and the meadows were a patchwork of yellow with the first of the summer flowers. Comparing these two paintings reveals a few differences in detail, such as the low fence in the foreground in the lower painting which is omitted in the upper, but by and large Astrup seems to have been very consistent, suggesting that his paintings were true to nature. Nikolai Astrup (1880–1928), A June Night and Old Jølster Farm (before 1911), oil on canvas, 88 x 105 cm, Private collection. The Athenaeum. Nikolai Astrup (1880–1928), Funeral Day in Jølster (before 1908), oil on canvas, 68 x 73 cm, Bergen Kunstmuseum, KODE, Bergen, Norway. The Athenaeum. 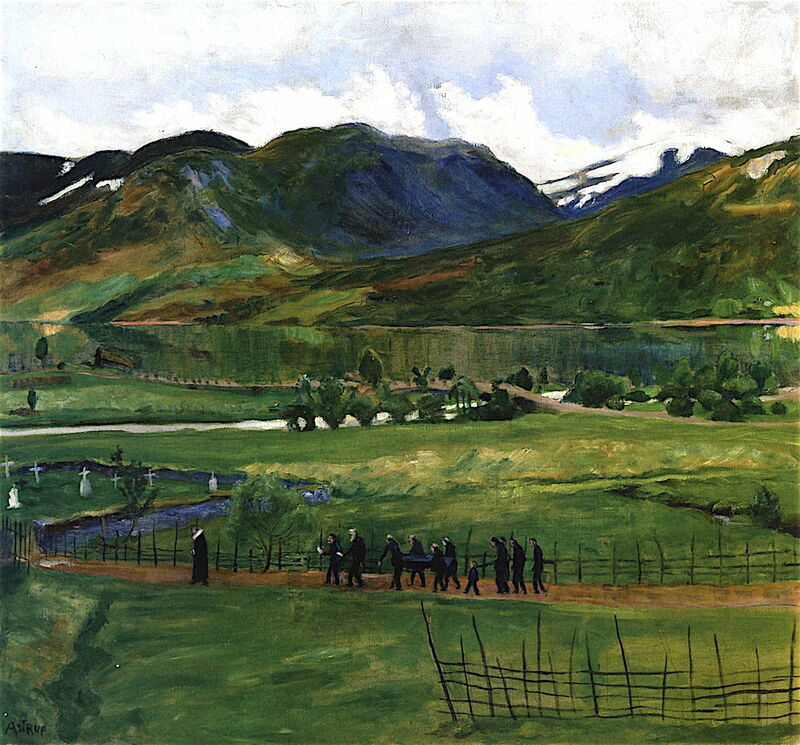 Astrup also recorded the public rites of the community, as in his Funeral Day in Jølster (before 1908). With the grandeur of the hills behind, a small party escorts the coffin of one of the villagers. His father, the pastor, leads the procession to the small churchyard – a rite which had taken place many times over the preceding centuries, and which was to continue for more. 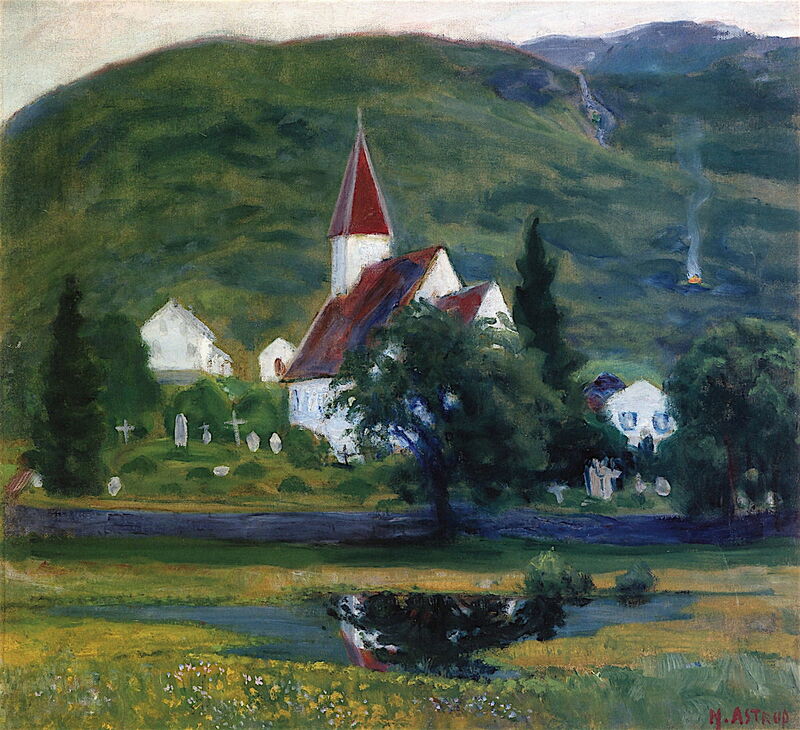 Nikolai Astrup (1880–1928), Ålhus Church (date not known), oil on canvas, 52 x 57 cm, Bergen Kunstmuseum, KODE, Bergen, Norway. The Athenaeum. Ålhus Church (date not known) is the church for which his father was pastor, and appears to have been in better condition than the parsonage was at this time. 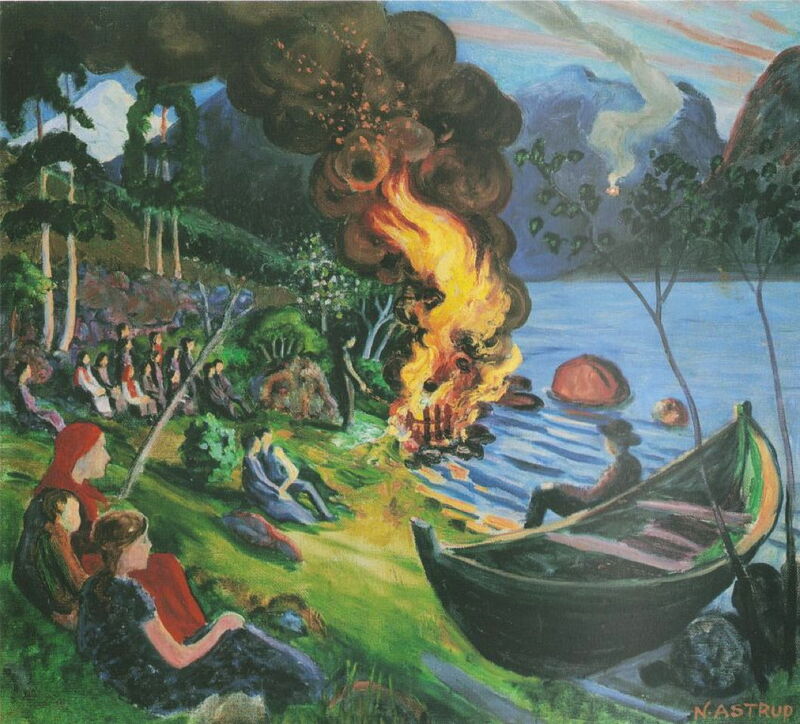 There is a large bonfire on the slopes behind, which might have been a part of the celebrations for Midsummer Eve, which was to become a favourite subject for Astrup. 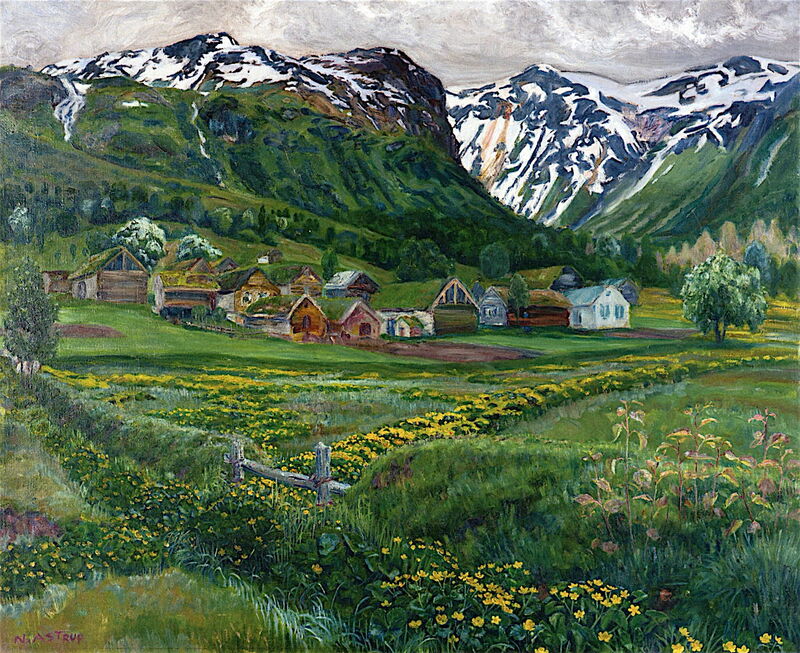 Nikolai Astrup (1880–1928), Ålhustunet, Jølster (early 1900s), oil on canvas, 71 x 101 cm, Private collection. The Athenaeum. Ålhustunet, Jølster (early 1900s) gives an excellent overall view of the scattered farms which made up the ‘village’ of Ålhus, and shows the river cutting through them on its way down to the lake. This appears to have been painted in the late summer, as the first of the autumn colours are starting to appear. Nikolai Astrup (1880–1928), Night (before 1908), oil on canvas, 57 x 54 cm, Bergen Kunstmuseum, KODE, Bergen, Norway. The Athenaeum. 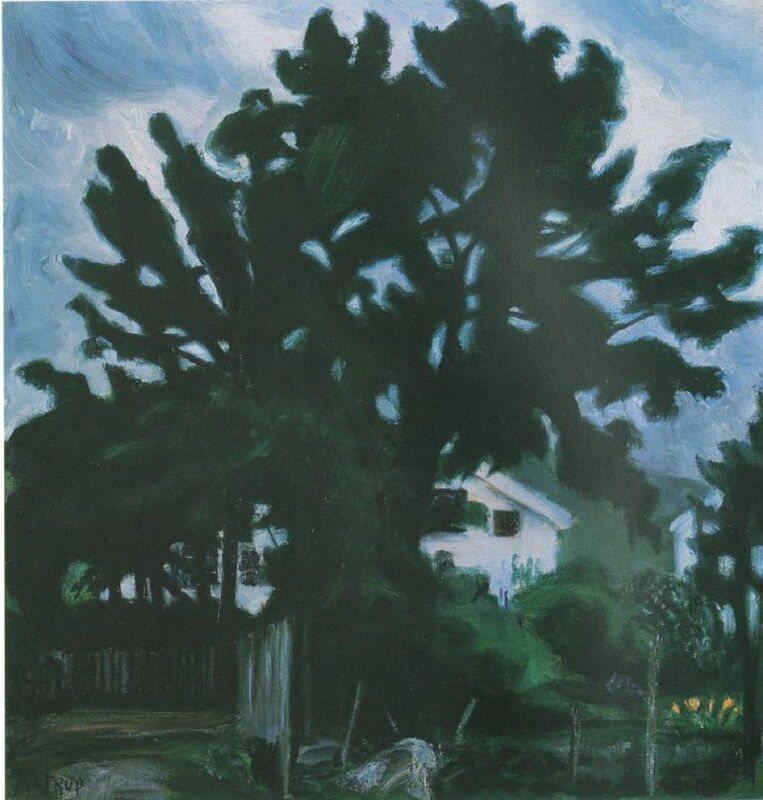 Astrup painted several nocturnes, some of which are strongly atmospheric, such as Night (before 1908), which shows the dark and vague form of a tree in front of the parsonage in Ålhus. Nikolai Astrup (1880–1928), The Shady Side of the Jølster Parsonage (before 1908), oil on canvas, 118 x 132 cm, Private collection. The Athenaeum. The Shady Side of the Jølster Parsonage (before 1908) is one of several unusual compositions which Astrup made of buildings, emphasising their perspective projections. This was the house in which he had been brought up, and in which he had begun his career as an artist. The old parsonage at Ålhus was finally condemned as being insanitary in 1907, and was then demolished. Just before Christmas, Astrup married a fifteen year-old local Jølster girl, Engel Sunde. Nikolai Astrup (1880–1928), Grey Spring Evening (before 1908), oil on canvas, 98.2 x 106.2 cm, Bergen Kunstmuseum, KODE, Bergen, Norway. The Athenaeum. 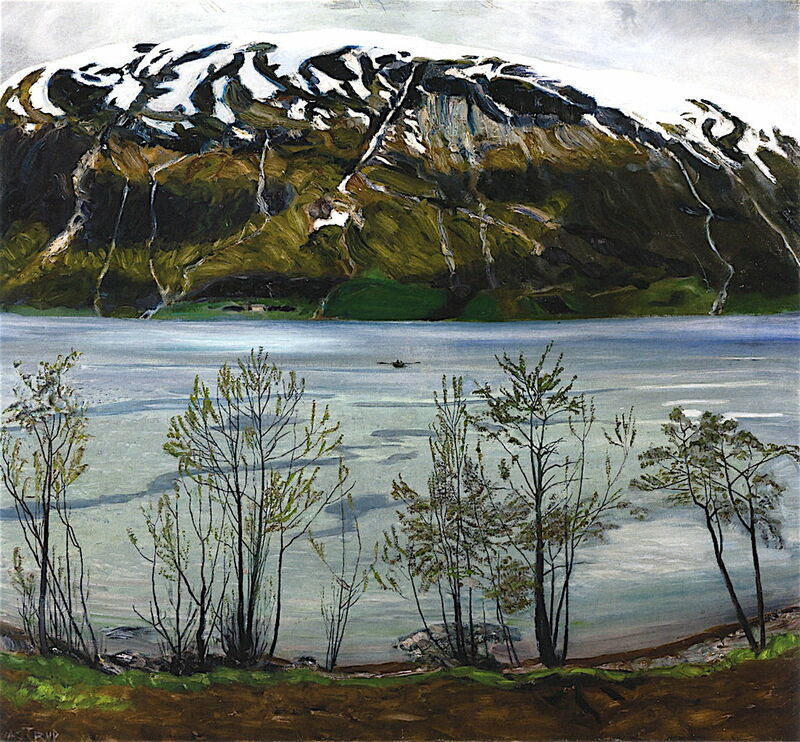 Grey Spring Evening (before 1908) is one of Astrup’s finest paintings of Jølster Lake. In its suffuse light, the hill dominating the opposite bank has rich earths and a shallow strip of green fields near the water’s edge. The pale green spring foliage on the trees in the foreground is muted, and a rowing boat out in the middle of the lake seems a tiny speck lost in the midst of nature. On his return to Norway, his second solo exhibition opened in Bergen. It was another success, with many of his paintings sold. 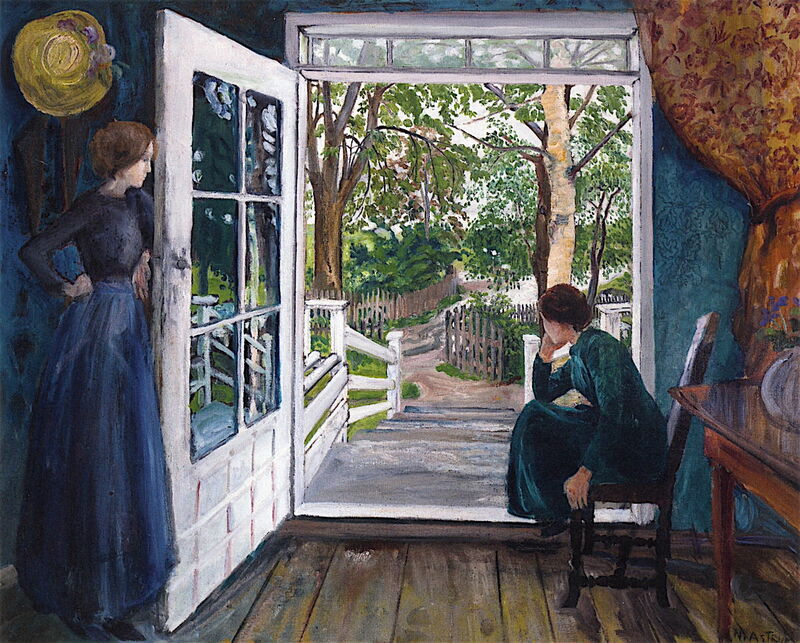 Nikolai Astrup (1880–1928), By the Open Door (before 1911), oil on canvas, 87 x 110 cm, Private collection. The Athenaeum. 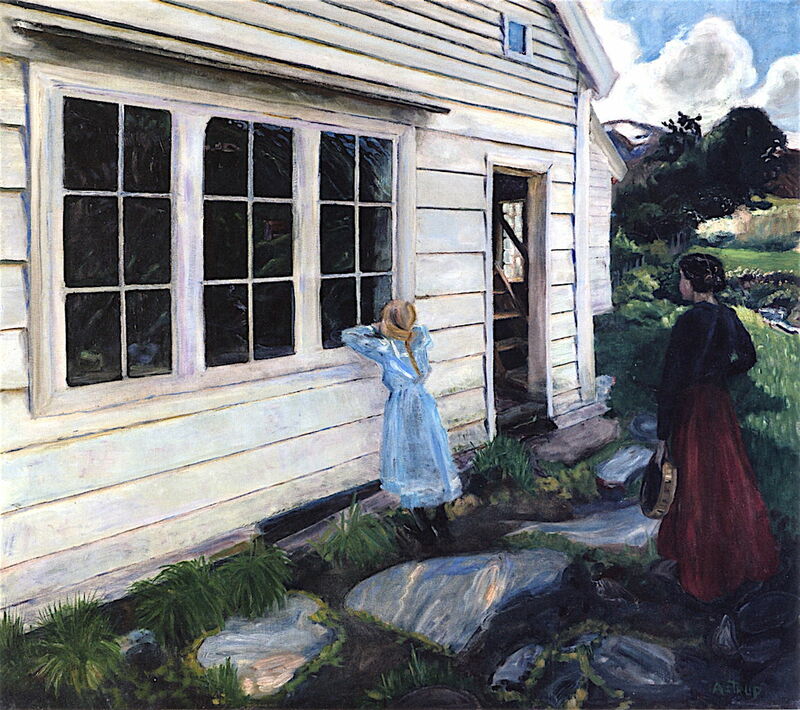 By the Open Door (before 1911) is an unusual painting for Astrup, and shows the influence of his former teacher Harriet Backer. It frames a landscape painting within an interior, and features two figures and some tricky reflections on the glass of the door. One of his most technically-demanding works, it demonstrates that beneath his assumed naïvety was considerable technical skill. 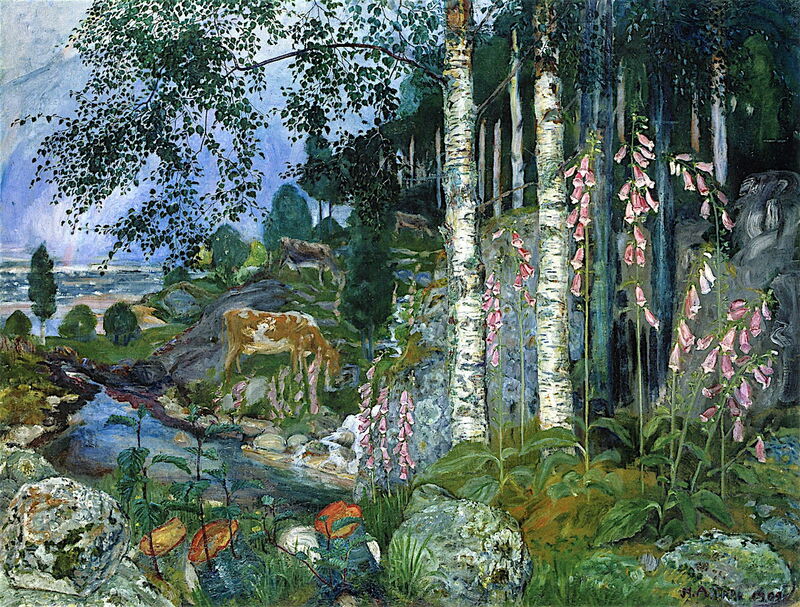 If you only remember one of Astrup’s paintings, it should surely be his Foxgloves (1909). Twin birch trees stand out unnaturally in the light at the edge of a dark wood, their leaves shimmering against a defocussed and vague background, with grazing cows. At the foot of the trees are the spindly stalks of foxgloves, their flowers hanging delicately from them. Small rocks are encrusted with rich growths of lichen, completing the gently magical scene. Astrup was to paint a similar motif in 1920, and to make a series of woodcuts, some of which are almost as rich in detail and colour as this painting. Nikolai Astrup (1880–1928), A Night in Spring (1909), oil on canvas, 86 × 105 cm, Bergen Kunstmuseum, KODE, Bergen, Norway. Wikimedia Commons. 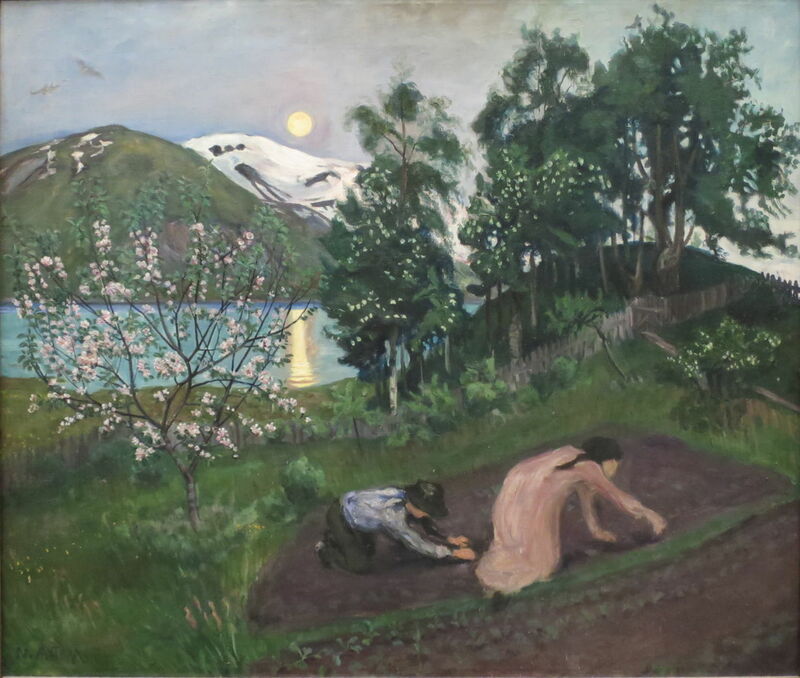 A Night in Spring (1909) is a nocturne from a series of paintings which Astrup made of these two figures working their small garden by the light of the moon, on the shore of Jølster Lake. Nikolai Astrup (1880–1928), St. Hansbål ved Jølstravatnet (Midsummer Eve by Jølstravatnet) (c 1909), 65 x 74 cm, Private Collection. Wikimedia Commons. But Astrup’s most enduring and magical series of nocturnes show the celebrations which take place on what may be known as Midsummer Eve, but is actually named Saint John’s Eve, which should be the night prior to the Christian feast day of Saint John the Baptist on 24 June, slightly later than the summer solstice. Known in Norway as Sankt Hansbål, and shown on the shores of Jølster Lake in Astrup’s St. Hansbål ved Jølstravatnet (c 1909), the occasion is marked by a large bonfire in each community. At the end of 1910, Astrup was busy preparing his works for his third solo exhibition, which was to open in early 1911 in Oslo. Posted in General, Painting and tagged Astrup, Backer, Gude, landscape, Norway, painting, Rousseau. Bookmark the permalink. Thank you – yes, and they get even better, too.